Home » Events and Blogs » Blog » How to stop procrastinating – NOW! 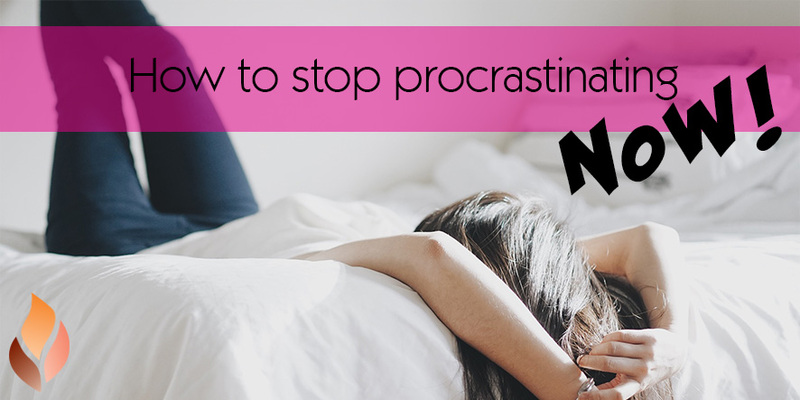 How to stop procrastinating – NOW! We all do it. We excitedly scribble a to-do list down on paper and feel pumped full of good intentions to tick it all off as quickly as possible. Then we get distracted. By anything. And everything. Even knowing that the exhausting to-do list exists seems to fuel us with a renewed enthusiasm to rearrange our nail polishes into an impressively neat, colour coded line. Suddenly, refreshing our social media feed is a full-time, demanding task that requires our un-divided concentration. Daydreaming while staring out of the window becomes absolutely fascinating. If you’ve made a list that’s four sheets of A4 long (front and back), you’re forgiven for feeling overwhelmed as soon as you look at it. Scribble everything down, take a breather, then prioritise your task list into sections. Be specific, set clear daily deadlines and stick to them. Start taking action and don’t allow yourself to drift into self-doubt. If you continually question every decision, you’ll never make progress. There are often several ways you can approach a task, the most important focus is getting it done, not how you do it. Remember when you were a kid and you got treats for doing chores? That worked well as a strategy, didn’t it? So, just because you have another decade or two under your belt doesn’t mean you can’t reward yourself for your achievements. You shall go to the movies – after you’ve replied to that email you’ve been dreading and called the plumber! Add a few things to your list that you’ll do anyway. When you get to tick them off you’ll have a sense of immediate fulfillment. Feeling that surge of satisfaction will inspire you to keep going. Or, add something enjoyable to dreaded task. For instance, get a presentation written while you’re at a café enjoying your favourite drink. Much as you try to kid yourself that tomorrow will be a better day to make a start on your to-do list, chances are it won’t. It’s highly likely that the day after that will be just as busy, as will the following week. There will never be a better time than now!